Emmy award winning The Amazing Race 2012 returns tonight to CBS with a new episode titled ‘This Is Wicked Strange.’ Last week’s episode of the race saw the teams head to Bavaria where teams scour King Ludwig’s quarters in the same castle that served as the inspiration for Sleeping Beauty’s castle, and tempers flare during one Team’s walk through a snowy labyrinth. At the end of the show Nary & Jamie and Kerry & Stacy were the last two teams heading to the pit stop. Nary & Jamie were team number seven to arrive at the pit stop – Eliminated from the race were Kerry & Stacy! If you missed the episode you can read our full recap here! On tonight’s show The race continues in Azerbaijan, where teams take part in a helicopter-evacuation training exercise. At a Detour, the duos must scrub excess oil off of some very hairy bathers. Two Teams hit the hay to see how well they stack up and Racers break out the sponges for an oily detour during the series first-ever trip to Azerbaijan. Season finale season is fast approaching and CBS announced this week that the finale of The Amazing Race will air Sunday May 6th, 2012. We will be live blogging the show with all the up-to-the-minute details at 8PM EST so make sure to come back to this spot and watch the show with us. Make sure to refresh often so you get the most current info! While you wait for our recap check out the sneak peek video of tonight’s show HERE! RECAP: Bavaria is the start of the six leg in the race around the world. Teams musts now travel over 2000 miles to Beku, Azerbaijan, once there they must find the fire temple “Temple Ateshgah” to get their next clue. Teams are now making their way to Beku, Azerbaihjan through Instanbul, Turkey. Rachel & Dave are the first team to arrive at the temple, they find a sign on the door that reads “Open at Sunrise”. The rest of the teams arrive and start dancing with the locals outside the temple. At sunrise, teams enter the temple to get their clues. A “Fast Forward” is offered, teams have to unload 150 bails and the first team to complete the task wins. A Fast Forward is a task that, once completed, allows the team that completes it to bypass all remaining tasks in the leg and proceed directly to the Pit Stop. Teams not going the Fast Forward, must now head to “Occupational Training International”. Rachel & Dave and Joey & Danny are trying the Fast Forward task. Art & JJ are the first team to arrive and get their clue. Its a Roadblock, “What comes up, must come down”. Teams must take on a terrifying helicopter crash simulation, under water. Meanwhile, Rachel & Dave have won the Fast Forward and can make their way to the pit stop. Joey & Danny need to make it over to the training facility with the other teams. Teams must now head to old town of Beku to find an old carpet shop. Rachel & Dave are the first team to arrive at the pit stop. As the winners of this leg of the race, both of them win a brand new Ford Taurus. All teams finish the crash simulation with relative ease, until we get to Ralph & Vanessa. Vanessa hates small spaces and being underwater and unfortunately she is the one that has to complete this task. Teams must now choose between “apples” and “oil. In “oil”, teams must head to Naftlan Health Center and with a metal shoehorn they must scrap the oil from a bathers body. Art & JJ are the first guy to arrive and are shocked to find some hairy dude that they have to clean off. Bopper & Mark are the next team to arrive, with Brendon and Rachel R. behind them. 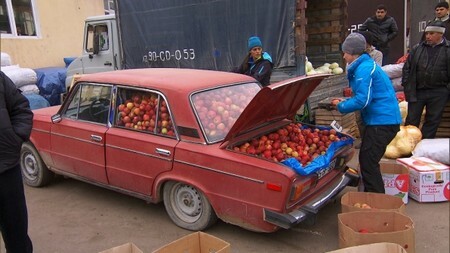 In “apples” teams must search on old car and rummage through a ton of apples to find one specific apple marked with a race flag. Nary & Jamie are the first team to try it out. Vanessa & Ralph are also going to give it a try. Joey & Danny are the next team to try their hand at the apples, while Vanessa and Ralph have just finished the task. Art & JJ are the first team to head to the pit stop, the last team to check in may be eliminated. Bopper and Mark are next to be done, with Brendon and Rachel R. heading out next. Nary & Jamie found their apple and are headed to the pit stop. Joey and Danny are running way behind, they just arrived at the carpet shop. Art & JJ are team number two to arrive at the pit stop. Bopper & Mark are team number three, Brendon & Rachel are team number four. Nary & Jamie are team number five. Vanessa & Ralph have lost their cab drive, lucky for Joey & Danny they have finished up their “apple” task quickly. Who will arrive first at the pit stop, Vanessa & Ralph and she says “cheese and crackers”. Joey & Danny are the last team to arrive, they are ELMINATED from the race. In the next episode, in two weeks, teams head to Africa and the claws come out with Rachel R. and Vanessa.